Pool parties and barbeques aren't complete without a delicious frozen treat. 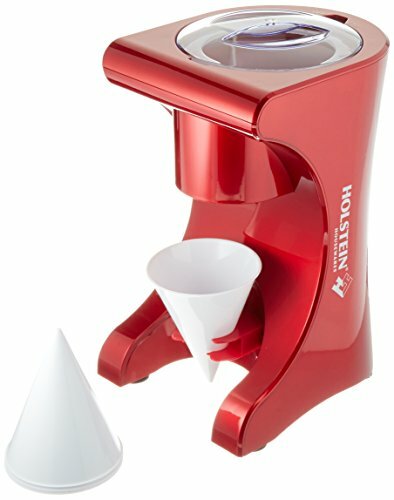 The Holstein Housewares Snow Cone Maker has stainless steel blades which serve up perfectly shaved ice treats hassle-free. Start the chilly fun by simply pouring in ice and using the safety locking lid. Shave ice to make delicious, refreshing treats and top off your ice delights with some wild berry syrup or fresh pineapple slices. With the 4 included reusable plastic cups you can prepare snow cones to satisfy everyone's taste buds, just add in your favorite toppings. Detachable parts make clean up easy. If you have any questions about this product by Holstein Housewares, contact us by completing and submitting the form below. If you are looking for a specif part number, please include it with your message.